Recently there has been a lot of discussion about what type of grades students should receive on their report cards. The majority of teachers and guardians still think that students should receive report cards consisting of numeric grades twice or three times a year (in Finland we use the grades 4-10, but if you are in a country that uses letter grading, for example A-F, the idea is still the same). The reason for this is obviously simple. 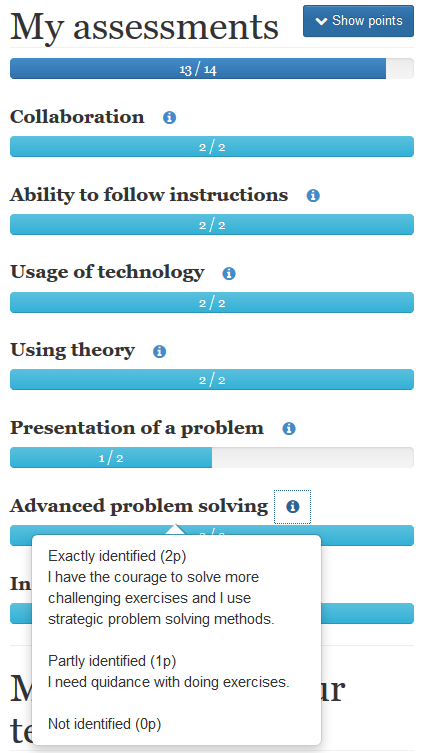 A guardian wants to see a grade that shows on what level the child is in each specific subject. For example, a child with a grade 7 in a subject is probably an average student, while grade 9 or 10 shows that the child is performing extremely well. At least this was the case when grades were mostly based on test results. Teachers are no longer supposed to hand out grades that are based only on how well students perform in a subject. Nowadays teachers should also take into consideration how well the student is collaborating, gathering information, thinking critically, how well the student is applying known information in new situations etc. This is because students are supposed to learn competences for life that also strengthens their metacognitive skills, which will result in even greater subject knowledge. What does this new situation mean for the students’ grades? It means that if there are two students, who both have the same grade in, for example, mathematics, they may perform quite differently if they are tested purely in maths. It is possible that these two students have completely different strengths and weaknesses. All of this means that a numeric grade is no longer sufficient for offering a complete picture of how well a student performs. Therefore, I would like to discuss how you can easily improve this system of offering feedback to both the students and the guardians, so that the feedback takes into consideration all the important competences students should learn. What we need is an easy way to show what we expect from the students and one way to do this is to create a matrix that specifies all the areas the student need to fulfill. This way the matrix helps students understand what they are supposed to do in order to learn. Here is an example of what it could look like in mathematics (the matrix is from www.ma.fi). You can notice that there are two columns in the matrix specifically for marking how well the student is performing in mathematics, so of course this matrix will give you that information. But the matrix also shows other things, like how well a student is working in school or at home, and this should of course be reflected on the student’s grade. This is obviously also important information for the guardians. What I am saying is that this matrix offers the same information as a grade would, but also much more. Furthermore, since the points in the matrix are adjusted continuously by the teacher, you are always able to follow the student’s progress. This makes report cards obsolete, which in turn comes with great positive effects, let me explain. If no report cards were handed out in the middle of the school year, the teaching pace would be more easily adaptable to the pace of students’ learning since there would be no deadlines. Also, tests are usually scheduled right before the due date of making the report cards, which creates stressful weeks for the students. These weeks, which consist of many tests or report deadlines, are a huge factor in creating major mental health problems for students. Therefore, a direct consequence of not having to make the report cards would have positive effects on both teaching and the students’ well-being. As the matrix offers continuously information about the student’s progress throughout the school years, the remaining question is what the diploma or the final report card should look like. Finland’s national curriculum states that at the end of junior-high, which is three years of studies, the teacher should base the grade in each subject mostly on student’s knowledge. The other competences should not be considered at same extent in the final diploma as in the mid-term report cards. I personally think that this is an okey idea. The matrix offers guidance during the time in junior-high, but in the end of the studies the students should be able to perform well in each specific subject. The question that arises is; how can the final grade be defined so that the meaning of the grade is equal for all students, no matter what school they attend? This, however, is a question I will address in a later blog. Are you interested in learning more about this matrix for grading students, and perhaps even try it out yourself? Then please visit Ma.fi (available in English, Swedish and Finnish). I have also written about how easy it is to implement this matrix in the classroom. If you want to learn more, then please press here. But aren’t you leaving out something important here? According to Finland’s nation curriculum you are supposed to make a similar grading in the end of each school year as you do in the end of junior high. Google translated: “The assessment of learning includes assessment of study progress as well as assessment of the level of knowledge and response about them. Progress is examined in relation to previous knowledge and to the goals set. A thorough follow-up is necessary throughout the basic education so that, with the aid of teaching, supervision and support, it must be possible to ensure that the student has the potential to make progress in the studies. So what does all of this mean? In my opinion it means that while the matrix in ma.fi is a great tool for grading progress, it doesn’t in its current form replace the report card since the grade is also supposed to inform you on what level the students knowledge is at in relation to the national assesment criteria. It should be hinting at what the grade will be when junior high is done. It is true that as a teacher you are supposed to assess the students’ level of knowledge. 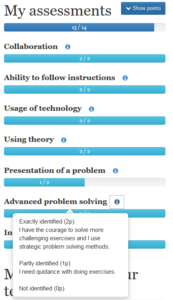 What I have done in the matrix from “ma.fi” is added an extra point on “problem solving”, meaning that the students can have the points 0-3. What I do is test my students to see that they can perform mathematically and roughly translated point 3 is grade 9-10, point 2 is 7-8 etc. so in the matrix you can see how well the students perform mathematically. If I understand you correctly, what is missing is a better tool to inform students and teachers on how well the students are performing in relation to each other throughout junior-high, so that their final grade is comparable nation wide no matter what school they attended. Personally I do think that this is true and I will address this question in a few months.